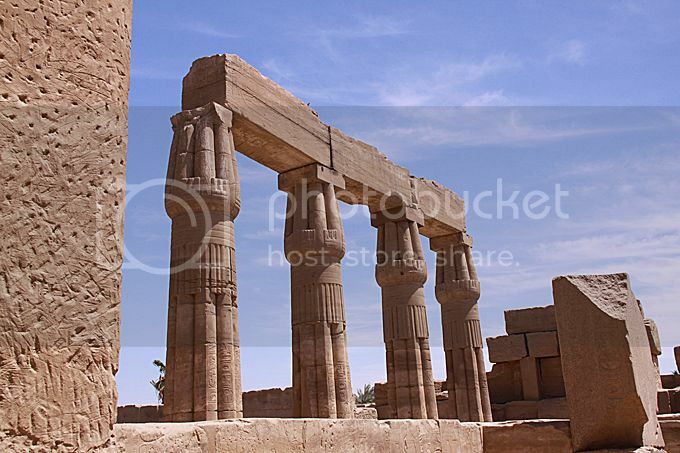 Egypt is full of columns, most of them ancient. I chose these because they're so well preserved and are a bit different, with the stylized lotus flowers at the top. What unique columns! My goodness, the artistry is wonderful. That's one of the things that amazed me everywhere we went, the beauty and, often, delicacy of the work, and there it still was, thousands of years later, not perfect anymore but still stunning. Those really are an unusual shape. Thank you. I had way too many possibilities to choose from, but these stood out. How lovely. I've always wanted to visit Egypt, although with the political situation a visit there is doubtful. I was there about a year before the political situation blew up, and I'm really glad I got the chance. Those are fantastic - thank you. Honestly, the ruins everywhere were so amazing and the light so good that it was hard to take a truly bad picture. A great pic! It's really amazing how well-preserved these are. Thank you. I was amazed at how much was still in good shape - considering its age - throughout the whole trip. In tombs and on the undersides of lintels you could see amazing detail and often still traces of paint.